Want to catch the attention of these “near me” searchers? Here are helpful tips on how to rank for their search terms in local search results. Stuffing your website pages with “near me” in your title tags, meta descriptions, and anchor text links is just taking one step forward and two steps back. You can attempt to optimize your entire site with “near me” terms and still end up ranking behind a competitor that’s actually located closer to the searcher. Or, on the other end of the spectrum, your business location may literally be the one nearest the searcher, yet you may still be outranked by competitors in “businesses near me” search results. So what are the factors that affect your ranking? Building and growing your online presence on local business directories and local listings sites can bring you closer to consumers who are looking for businesses nearby. Go ahead, plant those flags! Prioritize directories that rank at the top of the results for “near me” search terms. How do you find out which ones these are? You can start by performing a “near me” search that matches what your business is about. 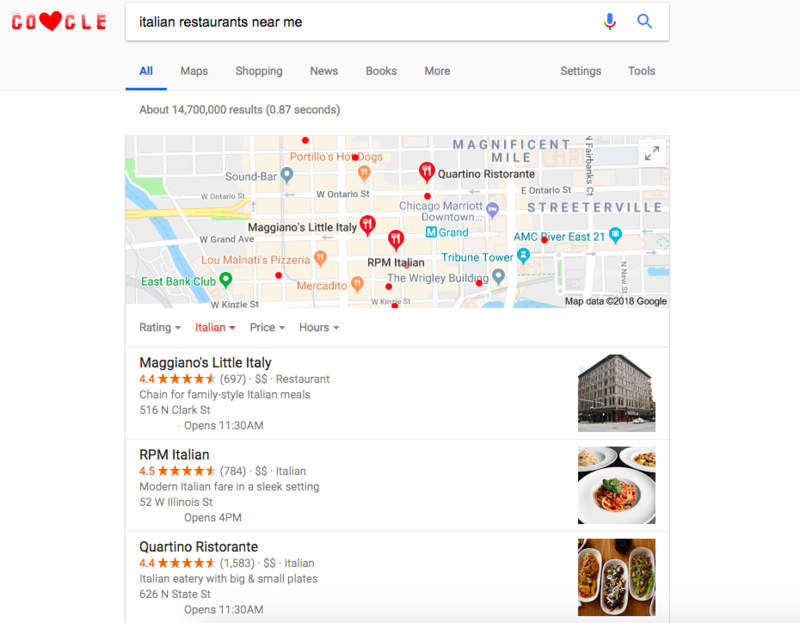 For example, the top results displayed for an “Italian restaurant near me” search on Google are from sites like TripAdvisor, Yelp, and Foursquare. This could be different if you’re searching for something else: the top “near me” sites will certainly vary depending on your business category or location. Once you find out which directories or sites to latch onto, it’s time to build out your presence on each. Claim and verify your listings. Update your business information and ensure NAP consistency. Check that your contact information is correct. Add photos and videos, when and where possible. Respond to reviews, and develop a strategy for generating new online reviews. Do you offer delivery? Is your location open 24 hours? Are you comparatively cheaper than your competitors? 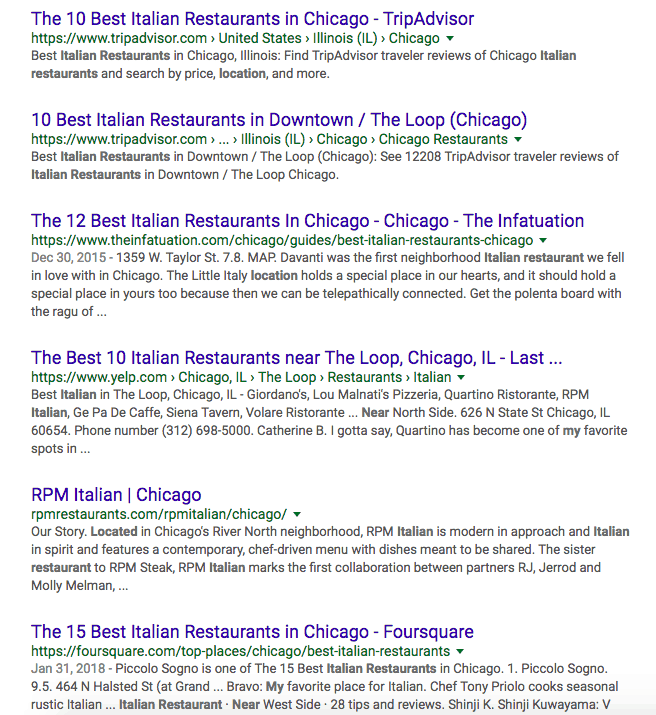 If so, work this information into your “near me” keyword optimization efforts: “Italian restaurants near me with delivery,” “Italian restaurants near me open 24 hours,” “cheap Italian restaurants near me.” That way, you gain more visibility in front of “near me” searchers who are looking for something very specific from a nearby business. When you’re optimizing for “near me” searches, it helps to share information about your business in a way similar to when you’re giving directions to a first-time visitor. For example, on your website pages, indicate which landmarks you’re near or which neighborhoods you’re in. Mention the non-competing businesses or popular spots you’re close to. Provide old-school driving directions. And add some exterior photos if you can. All these add up to relevant local content that will benefit your ranking in “businesses near me” searches. According to the 2017 Local Search Report by ReviewTrackers, most local searches (including “near me” searches) are done on mobile devices / tablets (57 percent for mobile + tablet, 42 percent for desktop). And 14 percent of local searches occur when the user is looking for a place to visit immediately. This means that, more often than not, mobile searches for “near me” businesses have actionable intent. You can help put your business in front of these ready-to-visit, want-it-now “near me” searchers by making it easy for them to call you. All it takes is adding a phone number on your site, which, if people click it, sends a behavioral signal (“mobile clicks to call”) to Google and other search engines, indicating that your business is indeed near the searcher, and that it is easy for the searcher to reach you by phone. By doing this, you are aiding the mobile experience for users and making it convenient for “near me” searchers to get in touch with your business: something that search engines will then reward with higher search results. A well-crafted review generation strategy can help you build greater online “prominence”: one of the three primary factors influencing Google’s local search results. Independent research firms have also cited review signals (quantity, velocity, and diversity of reviews) as one of the top factors influencing how and where a business appears in search results (including those for “near me” search queries). Naturally, your “near me” strategy should place due emphasis on collecting new reviews on Google. If you haven’t already done so, create and share a link for your customers to easily write reviews on Google and build hype for your business. Thank you so much for this information. Navigating google can be difficult sometimes but it is so important for your business to be visible on google because that is many peoples first go to when it comes to finding something nearby. This clearly explains the best way to stay relevant on google.